In March of 1910, Sugar House was annexed to Salt Lake City. Before that, if a home or business caught fire, the closest fire company had to come from downtown Salt Lake to fight it. The first Fire Station No. 3 was built because property owners demanded more protection for all the commercial and residential development that had changed the face of Sugar House. In its day, it was a thoroughly modern facility in every respect, with many up-to-date design features, according to the Salt Lake Telegram, Feb. 21, 1914. The building still exists at 1135 E 21st S as Adjusting Sails Dirtworks. Fire Station #3 on Simpson Ave.
By 1945, the fire company needed better equipment to serve the rapidly growing business and residential community, but budget constraints delayed the construction of the Simpson Avenue station until 1974. The initial design concept was a high-school drafting project by the son of former SLC Fire Chief, Leon DeKorver. The station was engineered using new building techniques such as concrete T-beams instead of brick veneer, which increased durability and reduced the cost of construction by 50%. Its architecture reflected the Modernist style of the period. Coincidentally, this was the period when energy conservation became a requirement for municipal buildings. After forty years, the proliferation of multi-story buildings in the business district and resulting increase in population has made the existing fire station obsolete. An extensive process to select a site and design a new facility began in 2014. The plan was to include a police presence in the facility and provide space for a multi-purpose meeting room that could be used for community meetings as well as for firefighter training and a command center for emergencies. After consideration, a portion of the Forest Dale Golf Course parking lot was selected for the new fire station. The property was rezoned and subdivided, and a six-month waiting period is underway for the public to provide input on removing the land from the city’s open space inventory. The Sugar House Community Council has forwarded comments from citizens concerning the loss of open space at the golf course, with additional concerns about lights, sirens, and traffic disturbing the nearby residential neighborhood. But the subject of most objections has been the architectural style of the proposed building. Salt Lake City has a policy for civic buildings that requires a net zero impact on power usage, which means that the building must generate as much energy as the facility consumes. To achieve that, the designers proposed using a flat roof with a large array of photovoltaic panels. According to Judi Short, Vice Chair of the Sugar House Community Council (SHCC), the community wanted the plan to respect the 1906 mission-style Forest Dale Golf Course clubhouse, and residents have suggested changes to the roof line and windows that reflect some details of the historic structure. Others have observed that the proposed building represents the current trend in architectural design, just as previous stations did. And like earlier stations, the primary driver for the design is the mission and function of the station. Salt Lake City Planning will update the full Sugar House Council at their June 1st meeting. 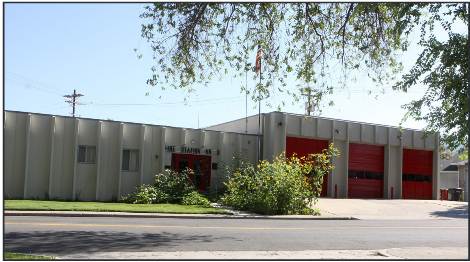 The fire station proposal is tentatively scheduled for a public hearing at the June 22nd meeting of the planning commission.